CHRIS DI BONA is the Open Source Programs Manager, Google Inc.; Editor, Open Sources: Voices From the Open Source Software Revolution and Open Sources 2.0. 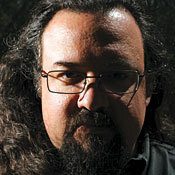 Before joining Google, Mr. DiBona was an editor/author for the popular online website Slashdot.org and He is an internationally known advocate of open source software and related methodologies. He co-edited the award winning essay compilations "Open Sources" and "Open Sources 2.0" and writes for a great number of publications. He was briefly the Linux guy on TechTV and speaks on a variety of open source issues internationally.